Our friends at the ARK Schools Network are seeking an enthusiastic new member of their Young Music Mentor programme. They are on the lookout for a new female vocalist to work with the alto section of the SPARK Choir, a vocal ensemble consisting of talented young singers from ARK and the wider community. – Paid opportunities to support our network-wide ‘Inspiring Excellence’ choir (called SPARK) and the choirs in each school. 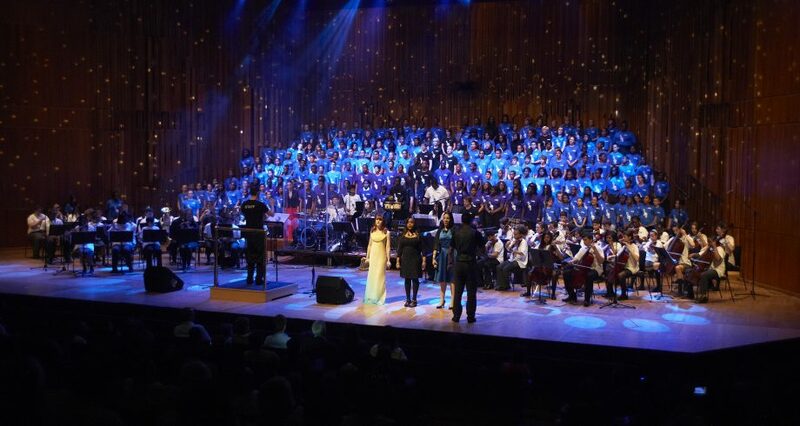 Last year, the YMM team provided invaluable support for residential trips and our Music Gala at the Barbican. – Network-wide training in vocal leadership. – Bespoke guidance – we work closely with each YMM to find the right opportunities for them to gain leadership experience and expand their skill-set. – Time to work with, and learn from, ARK Artists in Residence. – Signposting to work and training beyond the ARK network. 2. Using all that they learn and develop, the YMMs act as role-models for the young singers at ARK Schools. The successful candidate would need to commit to a number of Saturday rehearsals throughout the year, the SPARK Choir residential, and two performance events. There will also be opportunities to attend trainings and workshops. To download the role details, click here. Email jennifer.raven@arkonline.org for more details on how to apply!